WHAT BEFALLS THE BIGAMIST'S WIDOW? Luther Burbank wants you to go away. No, he does not want to hear about your prize-winning begonias. No, he will not talk to you unless you have an appointment. No, he will not sell you anything. Can't you read the sign on his fence? "Any person entering or trespassing on these ground will be prosecuted." Go. Away. Now. The thwarted public probably came away thinking Burbank as rude as he thought they. Couldn't he spare a single plant from the abundant fields surrounding his house? Can't they have one damn seed as a souvenir? Unfortunately, the articles that fawned over Burbank rarely mentioned his hybrids were sold exclusively through retailers, such as the Burpee and Stark Brothers seed catalogs and the regional Owl Drug Store chain. 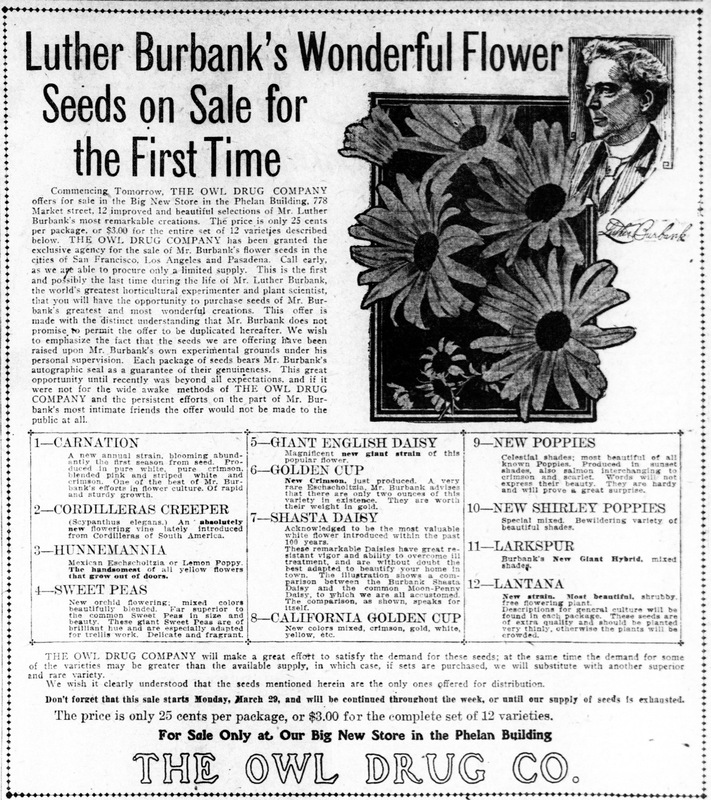 So it was very big news when it was announced in 1909 that three men had formed a company called "Luther Burbank's Products" to sell Burbank's seeds and live plants directly to the public. For anyone just tuning in, here's a short summary of what happened up to that point: In 1905, the prestigious Carnegie Institution awarded Burbank a grant of $10,000 a year with the understanding that it would result in some sort of scientific report about his plant-breeding methods. Two years later, Burbank signed a contract with the Cree Publishing Company to create a 10-volume set about his work. Burbank insisted the books for Cree would be aimed at a mass-market audience and not at all in conflict with what he was supposed to be producing for the Institution, but the Carnegie directors were not so sure. The Santa Rosa newspapers could scarcely contain their excitement over buying directly from Burbank to be bothered with accuracy. They blurbed the deal was "the most gigantic of its kind in the history of the country" (Press Democrat) and "said to have netted Mr. Burbank a couple of million dollars" (Santa Rosa Republican). The San Francisco Examiner also gave the "gigantic business enterprise" headline coverage and devoted nearly an entire inside page to Burbank. Also given much ink was that the main investors were the brothers Herbert and Dr. Hartland Law, who owned the Fairmont Hotel and other blue-ribbon real estate. In an interview with the Examiner, Dr. Law said the brothers were undaunted, although "we have begun to realize is a greater project than we thought it was when we first took it under consideration." The tasks ahead were monumental, particularly setting up a global distribution network which would "involve the expenditure of several million dollars." Let's hope they didn't spend too much money up front; less than a month later, Burbank announced that he was breaking the contract - "the proposition was found to be impracticable," he said in a terse statement to the press. "While it is true that my business has become too extensive and too complicated to be handled by one man, yet, I believe that by having complete control of the entire system I can direct competent men in a way to secure the best results," Burbank stated. What was Burbank thinking? It's understandable he didn't want to cede all control, but he was also 60 years old and had no talent or interest in building a large operation. No other suitors were courting him - it would be another three years before a similar distribution business was formed. With his chronic bad health, did he really expect to keep up the exhausting work involved with his plant breeding methods as he entered old age, staking his future on profits from far-between windfall sales? Also unclear in press coverage was the role of the third partner: Oscar E. Binner, whom several San Francisco papers unfortunately and repeatedly misnamed as "Dinner." Little was written in any of the papers about Mr. ?inner, except the vague description that he was a "wealthy Eastern man." When Burbank withdrew from the project Binner gave a lengthy statement to the Press Democrat in which he managed to say very little, revealing mostly his talent at public relations. Binner is an underrated figure in the Burbank canon; in the definitive biography by Peter Dreyer, A Gardener Touched With Genius, he rates scarcely more than Burbank's secretary, the euphonically named May Maye. But it was Binner who put together the ill-fated deal with the Law brothers, Binner who kept the Burbank book project from collapsing over the years, and Binner who masterminded a national campaign that brought Burbank acclaim greater than he had ever known before. Part manager, part counselor, part promoter, Binner aimed to be the Col. Parker to Burbank's Elvis and during Burbank's most successful years, he was something very much like that. When he met Luther Burbank in January, 1908, Binner was 45 and a respected man with two successful careers behind him. As a youth in the Midwest he had apprenticed as an engraver and printer and by 1895 the Binner Engraving Company was established as a leader in the business. (Which is to say, his company produced very high quality printed material - they were hired by the Smithsonian Institution to produce a book of photographs of the moon, for example.) They were pioneers in commercial illustration; search for "Binner Engraving" on eBay or in Google Books and you'll find dozens of examples that are today respected as topnotch period art. The trade magazines of the time are filled with mentions of him as a much admired - and sometimes, jealously envied - master of his craft. Advertising was a big part of the engraving business, and around 1901 Binner opened a branch office in New York City. In particular he cultivated a side career as an advertising director, becoming the head of publicity and promotion of Lever Brothers, an English soap maker. Binner's campaign to introduce Lifebuoy Soap as a modern, ultra-hygienic American product via photo-realistic ads was a remarkable success, and cemented his reputation as a successful ad man. In 1905 Binner returned to his engraving company in Chicago, selling it to his partner five years later when his attention firmly turned to all things Burbank. Much of what we know of Mr. Binner at that time comes from two extraordinary letters written to Nellie Comstock. (When she died in 1940, these letters were donated to the Luther Burbank Home and Gardens.) An accompanying note from her son Hilliard pointed out that Binner lived with their family on Hoen Avenue for a time, and Nellie sometimes acted as a diplomat to resolve disputes between Binner and Burbank because she was "an intimate friend of both." The origin of the connection between Comstock and Binner is unknown, but might trace back to their shared roots in the Chicago area. Binner came to meet Burbank via Cree Publishing, the Minneapolis company trying to produce the set of Burbank books. His exact status is unclear, but they must have already formed the Cree-Binner Company, which apparently had the sole purpose of wrestling the Burbank project into print. (Cree Publishing continued producing other books under its original imprint.) By 1910, Cree was completely out of the picture and Binner owned all work on the project produced to date. Megalomania aside, Binner was basically right; he possessed a unique skill set that Burbank needed. Burbank was an inept businessman and deal-maker; Binner had single-handedly built one of the leading companies in his field. Burbank expected fawning profiles in the press to lure public interest; Binner was an acknowledged master of reaching out through advertising. But most of all, Binner had a talent for what Burbank really needed most: Marketing Burbank's unique brand. You can find Binner's fingerprints over everything connected to Burbank in the years immediately following. 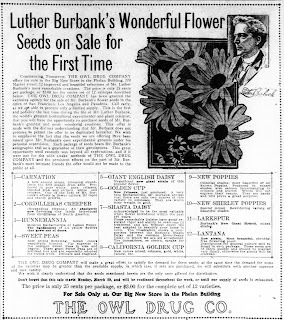 In a why-didn't-anyone-think-of-that-before flash of genius, Burbank was relieved of the visitor nuisance after a "Bureau of Information" was built on Santa Rosa Avenue in front of the farm where the public was invited to buy seeds, bulbs, and color lithographs of Burbank plants, suitable for framing. Binner produced dozens of pamphlets by and about Burbank and tried to sell shares in the Oscar E. Binner Company ("Luther Burbank's Publishers") for the publication of the still in-progress Burbank encyclopedia - "The popular edition will...have a field of about fifty million prospective purchasers," he gushed. 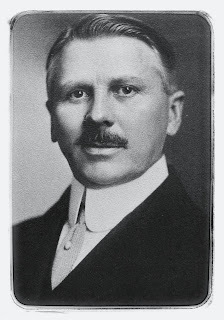 Binner created the Luther Burbank traveling display that toured agricultural shows and exhibitions around the country for two years to high acclaim, ending 1912 on view at the huge American Land and Irrigation Exposition at Madison Square Garden, where the Mormon Tabernacle Choir sang "Ode to Irrigation." This chapter of Binner's story ends in 1912, with the incorporations of the semi-autonomous Luther Burbank Press, Luther Burbank Society and Luther Burbank Company. Binner still had a role in Burbank's affairs, but that's a different adventure. Another Binner trail to follow leads to the question of whether he had any part to play in the final breakup between Burbank and the Carnegie Institute in the latter part of 1908. Although Burbank counted on the $10,000 annual sinecure, losing the distraction of the Carnegie obligation would have been greatly to Binner's advantage. The Luther Burbank Home and Gardens archive has a letter to the Institute's president from Binner that has an unpleasant tone and implies they were exchanging insults in prior correspondence. There's also an incriminating passage in that letter to Comstock: "L. B. misunderstands himself. When he finds himself, then he will see what is best for him and best for all time and all the world. He will waste no more of his talents and time on [the Carnegie Institute]..."
And finally, there's the unsolved mystery of why Burbank walked away from the lucrative deal with Law brothers. As it turns out, there are two versions of how it came about. In an interview with the Examiner, Hartland Law described the "peculiar way" the project began with a chance encounter on a train with a man coming to secure rights to "Burbank's book." Law expressed sadness that California had little appreciation for Burbank. Some time later, the same man approaches him outside the Fairmont. "This man later on visited Burbank, told him of the interest I had shown in his book, and in the end he was the medium through which my brother and myself met Burbank in this city and discussed the preliminary plans for this later project." But in his letter to Nellie Comstock, Binner wrote that there was no lucky happenstance involved. Burbank directed Binner to research potential moneymen and convince them to form a partnership: "...I was to find men of character, reputation and wealth who could handle this project as it should be handled. I worked hard, I traveled much and at last found two men, men whose names and reputation could not be assailed and whose wealth was more than sufficient to finance this project..."
The key to Burbank's about-face is probably the part about "men whose names and reputation could not be assailed." Yes, the Law brothers were multimillionaire property owners, and Herbert Law was one of the directors of Wells Fargo. But the paint was still wet on their respectability; not mentioned in the San Francisco or Santa Rosa papers was that the brothers had made their fortune through a quack medicine and pyramid scheme they still owned (this article is a must-read). Singled out by medical journals and muckrakers as one of the worst of all the insidious medical frauds, the money they offered Burbank dripped with blood. Always thin-skinned about being considered a charlatan himself, it's unthinkable that Burbank would have entered a partnership with the Law brothers if he knew about their dodgy source of income - or that he would have stayed with them once he discovered the facts later. Yes, the Laws kept their noses mostly clean and gained further respectability as years went on, but from the perspective of 1909, Burbank probably looked upon them as a career-destroying scandal waiting to explode after he discovered who they really were. In the end it was likely the Law brothers that played Burbank and Binner, not the other way around. Should the Laws ever be enmeshed in a scandalous wrongful death lawsuit, what better character witness to call to the stand than their partner and friend, Luther Burbank, one of the most respected men in the nation. Arrangements have been made by Herbert E. Law, Dr. Hartland Law, and Oscar E. Binner, millionaires of San Francisco, to take entire control of the commercial aspect of the work of Luther Burbank. The gentlemen have purchased the right to all the new creations of Burbank not otherwise disposed of previously and all those which may evolve through his genius in the coming years. The deal is one of the greatest ever made on the coast and is said to have netted Mr. Burbank a couple of million dollars, and placed him beyond the necessity of having any care for the material things of earth. He will now be able to lay aside business cares and worries and give his entire time and attention to the propagation of new fruits, flowers and shrubs, to which he has already devoted forty years of energetic work. The commercial portion of the distribution of the products will be carried on an elaborate scale by the men who have become interested in the matter. They will establish agencies in all portions of the world, and the fame of Burbank will be carried to greater extent in the remote parts of the world than ever before. Much illustrated and printed matter concerning the Burbank productions will be sent broadcast [sic] all over the world, and the handling of the business will necessitate a large clerical, office and shipping force. The spineless cactus will be sent to all the known arid regions, where it will produce sustenance for man and beast. It is claimed that recently Mr. Burbank has bred properties into this cactus which will make it available for producing sugar and alcohol as a by-product. It is said the sugar from the cactus will rival that produced from beets and that brought from the Hawaiian Islands. The new company intends to purchase, if possible, the rights which Mr. Burbank has previously disposed of to certain creations and thus have a monopoly of all his efforts. There are many things which Mr. Burbank has accomplished of which the world knows nothing, but in future all these will be given to the public through the new agency established. Mr. Burbank was recently in San Francisco and had a conference with the men who have purchased the rights to his creations and later they came here and spent some time in looking into the matters. The arrangement made with the Messrs Law and Binner will not affect the distribution of seeds through the Chamber of commerce. The deal of Secretary Brown will be carried out as arranged and he is already promoting their selling in a number of states. A business transaction of world-wide importance has been consummated in Santa Rosa, whereby Dr. Hartland Law and his brother, Herbert E. Law, the millionaire owners of the Fairmont hotel, the Monadnock building and other valuable property in San Francisco and elsewhere throughout the United States, and Oscar E. Binner, a wealthy eastern man, who has spent several months in Santa Rosa, have secured the rights... [missing lines type and garbled text] ...They have formed a company known as "Luther Burbank's Products, Incorporated," and have already formulated complete plans for the distribution of the products in all civilized countries. By reason of the deal consummated Mr. Burbank will henceforth devote his entire time to the scientific development of his great work, while the business and commercial end will be handled entirely by the company. The transaction not only includes the products already perfected but those in course of development. Big Work Planned by the Owl Drug Co.
Monday a representative of the Owl Drug Company of San Francisco closed a contract with Edward H. Brown of the Santa Rosa Chamber of Commerce for the exclusive agency of Luther Burbank's flower seeds for the cities of San Francisco, Los Angeles and Pasadena. Mr. Brown deserves great credit for placing the agency where it will do so much good for our town. We know of no concern better able to handle the distribution of Mr. Burbank's seeds on a large scale than is the Owl Drug Co., with its eleven big stores in San Francisco, Los Angeles and Pasadena. Mr. Burbank himself feels that the Chamber of Commerce need not look elsewhere for agencies as he believes, as do me, that the present arrangement will immediately consume the entire supply. Other big concerns have been negotiating for the agency, but due to the fact that the Owl Drug Company had better facilities to carry on the distribution thoroughly the agency was given to them. A month ago, it will be remembered, it was announced that Herbert E. Law, Dr. Hartland Law, San Francisco millionaires, and Oscar E. Binner, a wealthy eastern man, had completed arrangements whereby they would take over the entire charge of the distribution of Luther Burbank's products throughout the world. It was rumored here yesterday that the big deal was off and that Mr. Burbank had decided to still remain at the helm of the commercial as well as the creative branches of his work. Mr. Burbank preferred not to discuss the matter at all yesterday. Mr. Binner is in San Francisco,, and could not be seen yesterday. This combination was altogether unique--with the exception of Mark Twain, John Burroughs and possibly some other cases--in fact only an experiment, as nothing of just its nature had ever existed. Hence no one could foretell the outcome. The early developments did not indicate satisfactory future results either to the world or to the parties involved in the transaction. As no corporation had yet been formed and only a preliminary contract executed, when the proposition was found to be impracticable. It was mutually agreed that it be abandoned. While it is true that my business has become too extensive and too complicated to be handled by one man, yet, I believe that by having complete control of the entire system I can direct competent men in a way to secure the best results. On Wednesday Luther Burbank absolutely confirmed the report published in the Press Democrat of that morning that the deal between himself and the Law Brothers and Oscar Binner, had been abandoned. The deal, one of the most gigantic of its kind in the history of the country, involved the sole handling of the Burbank products and their distribution throughout the world, with the exception of two or three small contracts into which Mr. Burbank had already entered. The announcement in the paper Wednesday morning that the deal was off attracted something of the surprise of that of a month ago, which told of the preliminary contract. A Press Democrat representative had an interview with Mr. Burbank on Wednesday and obtained from him a statement explanatory of the abandonment of the contract. Mr. Burbank intends to be at the helm in the directing of his big business. He believes that with the assistance of competent men this can be done, and the best results secured. "For myself and by associates, the Law Brothers, let me say that Mr. Burbank's absolute happiness and contentment were our first consideration. "We still believe that to have equipped for Mr. Burbank a world-wide sales organization, such as we had planned, would not only have enabled him to devote more of his precious time to his noble and unique research, but also have been the means of giving to the entire civilized world an opportunity of getting a practical and most valuable benefit of his wonderful achievements. There is no doubt in our mind that with such an organization as we had planned for, consisting of some of the best world's workers, Mr. Burbank would have greatly extended his marvelous achievements. "Every plant, fruit, and product of this great genius would through this sales organization have been scattered throughout the civilized world and so become the property of all mankind. That our project (and when I say 'our' I mean Mr. Burbank first of all and the Laws and myself) was one which would have made the world better, is evidenced by the fact that hundreds of leading publications throughout the land recognized it as such, and heartily endorsed it, some even giving editorial recognition. Only one single article decried our project, and the man that wrote it admitted the next day that he had a 'grouch' on and was sorry he had written what he had. "As further evidence and a most gratifying one are the numerous letters that have been received by us from some of the most prominent and influential men throughout the land. Many from our friends, but many more from total strangers to us, congratulating us on our project and offering us unlimited support and assistance if we would give them the privilege. "One of the best and most responsible endorsements we received was from a man who, perhaps, is better able to judge and recognize what this great project would have meant to Mr. Burbank and the civilized world. I refer to an old and much admired friend of Mr. Burbank--Prof. E. J. Wickson, whose editorial in the Pacific Rural Press came nearer to our personal views and sentiments than all others. "However, as already stated, Mr. Burbank's happiness and contentment was our first consideration, and if this would in anyway be involved by the project we were willing to step aside and annul the contract we entered into together on the 23rd of February. "Mr. Burbank has many true and loyal friends throughout the world, yet none I feel can be more willing to help and assist him at any time than the Law Brothers. As for myself, I have always given him the best there is in me, and I shall always continue to deem it a pleasure to serve him." Luther Burbank's Bureau of Information will be opened to the public today from 10 to 12 and 2 to 4, and each succeeding day, Sunday excepted. It occupies the neat and attractive little building on Santa Rosa avenue fronting the old Burbank residence. This branch office is designed for the accommodation of visitors, having been found necessary in order that Mr. Burbank be protected from the constant interruptions which have beset him in the past by those who wished either to meet him or to have to opportunity of securing information or samples, souvenirs, seeds, bulbs, etc. These have note heretofore been generally obtainable except from Eastern dealers. Some scientifically accurate extremely fine studies of his newer fruits and flowers have been produced by California artists and Eastern lithographers, and these will be available to all. Rare seeds also, all grown under Mr. Burbank's personal supervision, will be available. A big register is being prepared for the names, addresses and remarks of visitors. All are welcome to inspect the new office. The information bureau at Luther Burbank's private experimental grounds on Santa Rosa Avenue is proving a great thing for visitors in this city, who are desirous of obtaining some information concerning Mr. Burbank's work and also as to where seeds, plants and literature, etc., can be obtained. The handsome little building the bureau occupies near the site of the old residence has already been visited by several hundred people from out of town. Some fifteen states are represented among the callers and they are people who have come to Santa Rosa for a visit while making an itinerary of the state. Several countries are likewise represented. Most of the time Miss Pauline Olson is in charge of the Bureau and no one better qualified or more conversant with the nature of the information desired could occupy that position. Daily some of the beautiful blooms created by Mr. Burbank are artistically arranged in the room and these never fail to attract the admiration from visitors. The poppies and amaryillis are in bloom in the Burbank gardens at the present time, and the color picture is a very beautiful one. Labels: 1909, 1910, burbank, ComstockNellie, Cree Co.